Peres Projects is pleased to present the first solo exhibition of Ajarb Bernard Ategwa in continental Europe. Ategwa’s (b.1988, Cameroon) large format works mimic the scale of cityscapes and public spaces, and his vivid color palette and graphic style speak the language of advertising familiar to inhabitants of Douala, Cameroon’s largest city and economic capital. Historically, Douala has had a wide range of foreign influences. More recently, the city has had an influx of migrants from both within the country, as well as from neighboring regions. This has shaped Douala into the diverse and contemporary city that is the source of inspiration for Ategwa’s work. Moving between the taxi stands, newsagents, bars, roadside markets, hair salons, and citizens in fleeting moments of respite, the artist offers snapshots of everyday life. With a unique use of line and color, Ategwa weaves together these urban scenes, sounds and smells to create a rich sensory immersion. As we pan through the tableaux, each painting adds a line to a larger story which is unfolding in real-time. Employing these narratives, Ategwa is part of a new generation of Cameroonian artists who are pushing the medium of painting forward by adding their own imagery to the lexicon of painting where it has not previously existed. In Europe and North America, contemporary African life is often subject to preconceptions and stereotypes. 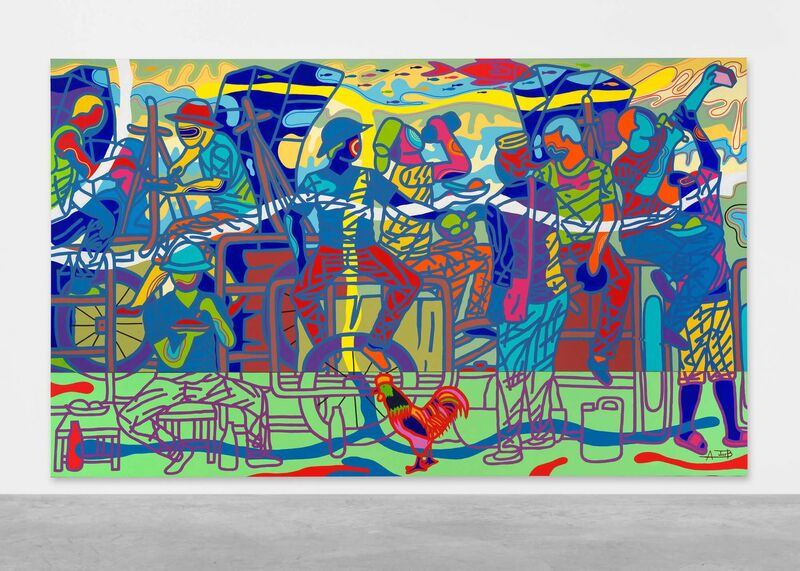 Ategwa’s distinct style of modified figurative painting, based on Cameroonian pop culture, is focused on the day to day realities of a bustling African metropolis. By using imagery lifted directly from present day Cameroon, Ategwa’s work counters these generalizations about the African experience with a nuanced perspective. While deeply linked to the artist’s time and place, Ategwa’s abstract rendering of the human figure opens the door for all of us to see ourselves in his tableaux. Expressing universal values and ambitions, Ategwa approaches powerful topics with both a sense of humor and precision, granting us access to a dynamic world which is thriving in the 21st century.